Search all homes for sale in The Woodlands, Texas. Get unlimited access to our MLS search, save listings, get price reductions, new listings & much more! The Woodlands, a top master planned community, is home of several corporate campuses among the most notable are the Woodforest National Bank, Anadarko Petroleum Association, Baker Hughes and many more. These companies have created what the community developers always wanted, a self sufficient city, with a strong economic foundation that creates jobs for the residents within the community. Homes in The Woodlands are located in a very forested and picturesque area with neighborhoods surrounded not only by nature but by a friendly and a united community that help to build the foundations of one of the best residential developments in the United States. Nature in The Woodlands, Texas is a common landscape; the area is surrounded by dozens of parks, forests and lakes, with a community that retains trees with pride. The Woodlands schools is part of the best district of schools and the best ranked institutions in the state of Texas. More than a few schools have won uncountable scholarships, have organized charitable and humanitarian activities, and not to mention the many sport trophies the district holds. Also, Houston and its surrounding areas have the best ranked hospitals in the countrywith state of the art technology making any health problem just a passing and endurable problem. The Woodlands is without a doubt the most ambitious and accomplished residential community ever made, with affordable prices for homes. If you are looking forward to buy a house in The Woodlands, the experts at Tamborrel Properties will gladly assist you through the whole buying process. All our services are free for buyers and investors. When it comes to buying a home, our real estate agency is the best option. Tamborrel Properties specializes in new and custom homes in The Woodlands, TX. Our agency works along with the best homebuilders in The Woodlands and surrounding areas in order to provide the best homes and whole information about dimensions, features, location, price and footage of said homes. Tamborrel Properties will provide you with continuous research updates, inspection reviews, and a personalized customer service through the whole process, from the search of the home you want to buy to the moment the transaction is closed. We work closely with the main home builders in The Woodlands area. Review builders in The Woodlands, Texas. With 15 years of experience in the real estate market and lots of satisfied customers around the The Woodlands, Tamborrel Properties is the best agency to work with. Call us now a (832) 482-9367 to start looking for your dream home. Work with the best, work with Tamborrel. If you are looking to sell your home or a property, trust Tamborrel real estate experts to help you out with the whole selling process. Tamborrel Properties focus its efforts on an intensive marketing campaign for its sellers. We also work along with photography experts, so your home looks the best when potential buyers see your house in our website. Our websites bring a vast amount of home buyers looking to buy a home within the first 6 months. We also make an extensive promotion in the social media sites such as Facebook, Twitter and Youtube. Your home will be in the spotlight for potential buyers. Experience is also a key element in our success in selling homes. Our real estate agents have acquired great experience negotiating multimillion dollar contracts in different fields including North America, South America and Europe. Be sure that our team will do their best when selling your home, offering the best personalized customer service. This way, your home will get all the promotion it needs to be sold in a short period of time. 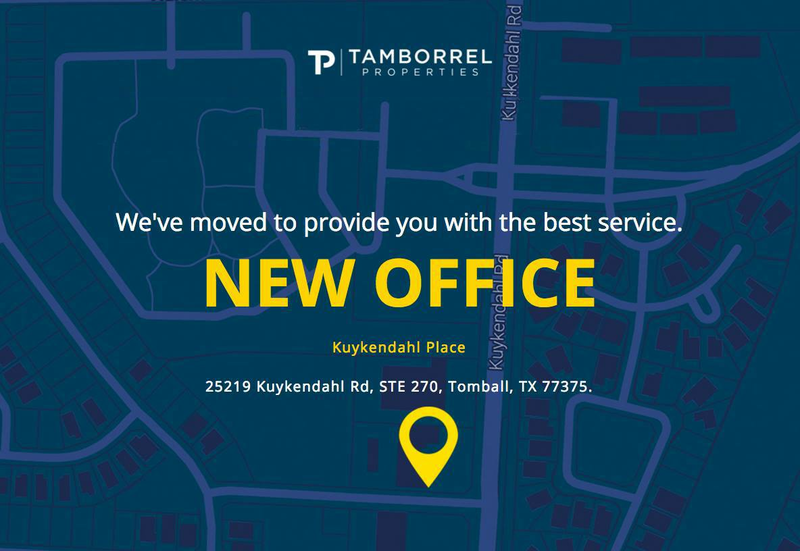 Tamborrel Properties will give the extra lap to make sure you are getting the best real estate service in The Woodlands area. We’d like to hear from you. Call us at (832) 482-9367. If you are relocating to The Woodlands, Tamborrel Properties will provide you with all the information you need about the community such as their amenities, features, educational institutions and more. Our relocation team will evaluate your needs and provide you with personalized assistance according to them. The Woodlands is a master-planned community subdivided in villages. This community is highlights the perfect blend between urbanity and nature. The Woodlands features amazingly beautiful parks and golf courts, perfect for outdoor activities; and the best entertainment options, shopping, dining options, schools and high quality health care. We can help you relocate to The Woodlands, call (832) 482-9367 or email us. With the help of Tamborrel Properties relocation team, you will be able to enjoy all the amenities in The Woodlands in no time. You will be provided with information about the neighborhoods and the amenities, information about the home-buying process and a list of essential services in the area. Work along with Tamborrel Properties relocation team and find out all The Woodlands has to offer. Find your dream home with us. Call us at (832) 482-9367. The Woodlands, Texas is the most celebrated master planned community in Texas located at the Northwest of one of Texas more cultural, and beautiful cities, Houston, located only 32 miles from Houston's downtown along the Interstate 45 Highway. Although it started with the plan of being a suburban single family home community, the growth and development of The Woodlands Tx have attracted more than a few businesses and corporations, making The Woodlands, Texas its prime market. If you have any questions about The Woodlands real estate, feel free to Contact Us or Call (800) 891-5818 - we are here to help you find your dream home in The Woodlands!